For my mental health I like to take long hikes in a nearby park that surrounds a miles-long lake. Most of the park is forested with large stands of mature oaks, maples and beeches. But one small section passes through a scruffy patch of eastern red cedar. The trees are small and monotonous— ramrod straight trunks with short lateral branches covered in prickly dull green needles. They look like large toothpicks and vary only in height. I normally walk quickly past, anticipating the more attractive sights ahead. But on my last stroll a few weeks ago I suddenly stopped in the middle of this cedar forest, turned a full circle, and said, “My god! What great masts!” Like Elmer Fudd, who could look at Buggs Bunny but see only a steaming roast rabbit, I looked at the cedars and suddenly saw nothing but a harbor full of sailboats, their tall wooden masts waving back and forth in the wind. I nearly salivated. Nearly any one of the trees around me would be perfect. The trunks were unfailingly straight, many were the right diameter and cedar is famously rot resistant. The tiny lateral branches could be removed in minutes and a quick once over with a plane would give me a sturdy and fully traditional mast for my Pocket Cruiser. I’m a firm believer in the “take nothing but photos” philosophy of nature appreciation but for a brief moment I had unworthy fantasies of chainsaws at midnight. Of course I let the fantasy pass and continued my walk, but my mind continued to work on the problem of locating a mast for my boat. I needed a sturdy piece of wood, fifteen feet long and three and a half inches in diameter at the bottom, tapering to two inches at the top. 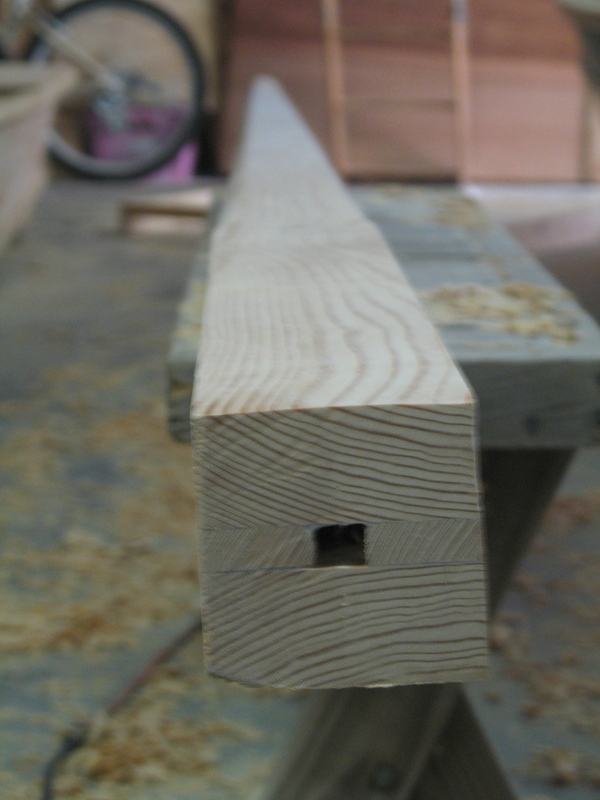 My instructions told me to simply taper a long Douglas fir 4 x 4. But my local lumberyard doesn’t stock untreated 4 x 4’s longer than twelve feet, nor does it stock Douglas fir. It could be special ordered, but I balked at the price. I needed a more economical solution. A simple solution would be to simply laminate two 2 x 4’s, but there’s a small problem: The resulting board would be too narrow. Two by fours are, of course, actually 1 ½ x 3 ½ inches. Two laminated boards add up to just three inches—a half inch too narrow. That’s not a big difference, but it bothered me. My mastbox—built over a year ago—is built for a square mast—3 ½ inches in length and width. While mulling over the problem, my wife gave me a copy of George Buehler’s book, Backyard Boatbuilding, for my birthday. It’s a classic in the small universe of amateur boat building literature and I had hinted strongly that it would make a perfect present. Buehler builds traditional boats—plank on frame construction of heavy, ocean-worthy cruisers—but does not apologize for taking shortcuts and using inexpensive materials. His framing comes from the lumberyard and he shows builders how to make economical poured cement keels that can replace more difficult and expensive lead and iron keels. Since I have sworn off epoxy, I’m looking for ways to build traditional boats in affordable ways. His book is stuffed with inspiration and spiced with his quirky hippie -cheapskate-libertarian (I can’t decide which) philosophy of life. On the subject of masts, Buehler prefers tree trunks. They’re cheap and, if well chosen, are straight and pre-tapered. For his 30, 40 and 50 foot cruisers, they fit the bill perfectly. But for those of us who don’t have ready and legal access to the perfect tree, he reluctantly describes construction of a laminated mast. It’s a simple affair: Two outer layers sandwiching a single inner layer. He describes it as the “traditional box-section mast” used by professional boat yards that can be assembled either solid or with a hollow gap in the middle, which lightens the mast and allows wires to run up the mast for lighting. A single 2 x 10 provided all the lumber for my mast. Accepting his concerns, I still felt that a carefully constructed laminated mast was a reasonable choice for a small boat that will never see the open ocean. And after thinking about the problem and reading a few postings on the Wooden Boat forum, I formulated my plan. 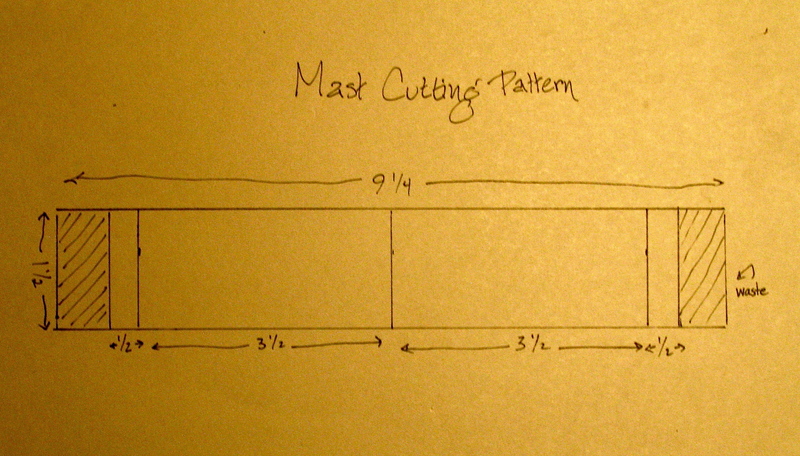 As the sketch shows, the whole mast was built from a single sixteen foot length of 2 x 10. From this, two 3 ½ inch wide outer layers were ripped with my circular saw, along with two ½ inch strips that serve as the inner layer. The strips left a half inch gap in the middle, which means that I technically have a hollow core mast, although this was not intentional. I don’t plan to run wires and I think the weight saving is negligible. It’s just how it turned out. 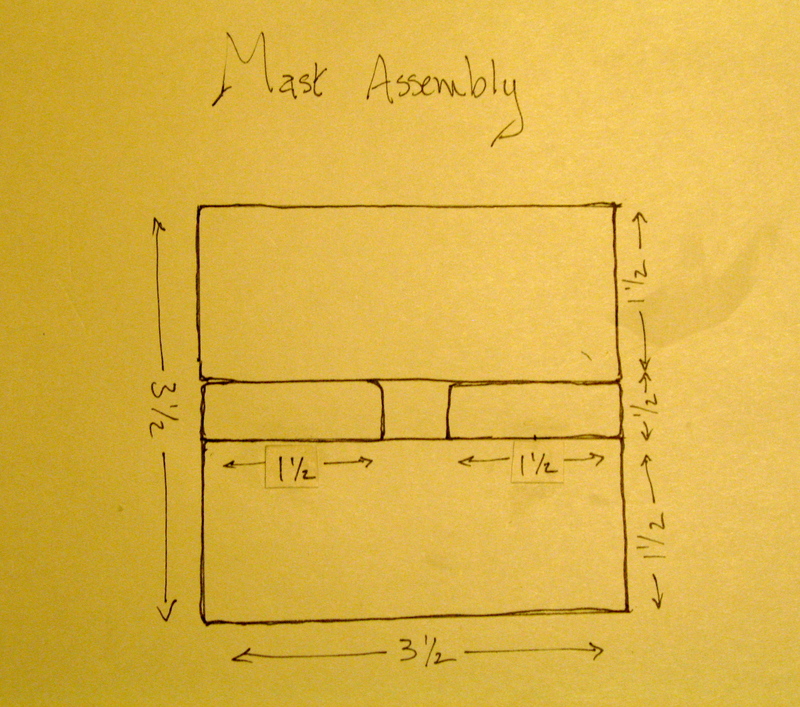 Assembled, the mast looks something like the second sketch. Holding my breath (almost literally) I mixed up a batch of thickened epoxy, coating all inner surfaces and clamped it all together. I really didn’t have enough clamps (builders never have enough clamps), so I used a couple of drywall screws in placed where the wood seemed to gap. The next step was to taper the mast. When the epoxy hardened, I followed the cutting pattern provided in my instructions and used the circular saw to narrow the mast from 3 ½ inches at the base to 2 inches at the top. Two cuts were required for each side—which made a lot of sawdust and tested my underpowered saw and cheap blade. The rest was easy—and even fun. I like when I can use my traditional woodworking skills and I enjoyed the hour spent chamfering the edges with my antique jointer plane. The final step was to apply a single protective coat of clear epoxy (the last application of epoxy on my boat, I hope) and several coats of “Last N Last” marine varnish. The result is a very long, very heavy piece of wood. It’s not a romantic as a cedar tree trunk, but it looks pretty good. I’m one big step closer to the end. You are currently browsing the Build a Boat, Sail Away blog archives for September, 2010.